As John Knox, UN Special Rapporteur on Human Rights and the Environment has noted, "the failure to include a right to a healthy environment in the seminal human rights instruments is due to timing, not substance." Science had not, by 1948 or even 1966, provided evidence for the fact that human induced climate change causes environmental disruption that undermines human rights. It was not until 1992 at the United Nations Conference on Environment and Development (UNCED), also known as the Earth Summit, that governments created the United Nations Framework Convention on Climate Change and "Determined to protect the climate system for present and future generations." Curiously, the Convention, makes no reference to 'people' but it is of course concerned with how the concentration of greenhouse gases "may adversely affect natural ecosystems and humankind." Since 1992, the various reports of the Intergovernmental Panel on Climate Change have provided us with unequivocal evidence of the negative impacts of climate change on people. The scientific community, the legal community and the community of people on the front-lines of the impacts of climate change who are demanding climate justice, all understand that the threat to the environment is a threat to human rights. For people living in the small island developing states, the impacts of climate change pose an immediate threat to their lives because of rising sea levels and stronger and more frequent tropical storms. For people living in Sub-Saharan Africa, the more frequent droughts and extreme temperature rises pose an immediate threat to food security and health. From Alaska to the Philippines, indigenous peoples have been particularly affected, and the gender dimensions of climate change -- the different impacts on women and men -- have received increasing attention. The new climate agreement, to be negotiated at the Conference of Parties in Paris (COP21/CMP11) will frame the future of our lives on this planet. It will shape how we plant and harvest our food; how we build our cities and transport networks; how we power our homes and our industries. The inescapable reality is that this agreement is about people; our daily lives and our livelihoods. It is about the opportunity for all members of the human family to live lives of dignity and equal rights. Therefore, logic dictates that the agreement should be grounded in human right norms, including gender equality. As the world moves to take action on climate change, we must ensure that in saving the planet we don't trample on the rights of people made vulnerable by poverty or social standing. By requiring the design of future actions on climate change to respect and protect human rights, and by including gender equality, the new climate agreement can safeguard the dignity of those who are least able to adapt. We have in the past seen examples of climate actions that undermine human rights. Communities have been forcefully displaced from ancestral land to allow for the construction of hydroelectric power stations or the preservation of forests. The conversion of corn to ethanol for fuel has caused spikes in food prices and threatened people's access to food. We must achieve a just transition from fossil fuel based development to low-carbon development, a transition in which all people are able to take part and share the benefits. In these final days of negotiations for the new climate agreement I find myself referring more and more to Article 1 of the Declaration which states "all human beings are born free and equal in dignity and rights." An international climate agreement that respects human rights norms, including gender equality, will ensure the dignity and rights of current and future generations; they are after all the very people the agreement is mandated to protect. Puntarenas, Costa Rica: Costa Rica is a country leading in climate action that is good for people and the planet. 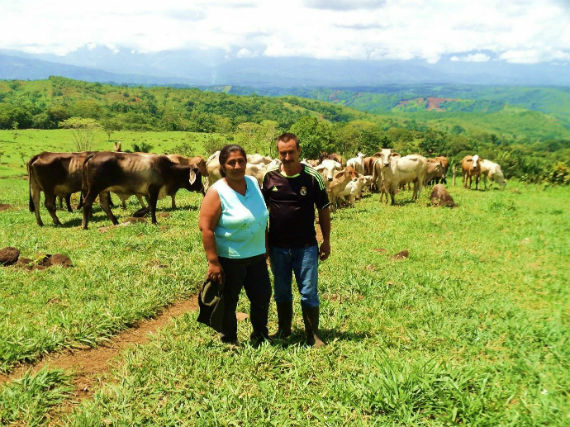 Enabled by the General Environment Law that was adopted by the government of Costa Rica in 1995, Janet and Eduardo Obando who run their small family livestock farm near Buenos Aires in Puntarenas, took part in training to improve their agricultural practices, make their farming more sustainable and contribute to a healthier environment in Costa Rica. They now contribute to global climate action while enjoying the benefits of a more secure income and improved well-being. Mary Robinson, seventh President of Ireland and President of the Mary Robinson Foundation - Climate Justice. Robinson also serves as United Nations Secretary General's Special Envoy for Climate Change. NOTE: The eleventh part of the second session of the Ad Hoc Working Group on the Durban Platform for Enhanced Action (ADP) will take place in Bonn from 19 -- 23 October 2015. This is the last negotiation session ahead of the opening of the COP21/CMP11 in Paris. The Co-Chairs' non-paper containing the basis for negotiation of the draft Paris climate package will be discussed in over the course of the next five days.